Everyone remembers the absolute furore a couple of months ago over that story in The Canary that the BBC political editor Laura Kuenssberg was listed to speak at the Tory Party conference right? It didn't seem to matter a jot that Kuenssberg was actually listed as a guest speaker in Tory conference publicity, the mainstream media picked up her subsequent denial and created the narrative that left-wing independent media is creating "fake news". Of course the Canary article attached more importance to the event literature about a Tory party fringe event than it was probably worth, but they absolutely didn't fake the evidence that she was listed as a speaker there, and the question of why the chief political editor at the (supposedly impartial) BBC was listed as a speaker at the Tory party conference was actually a legitimate one. 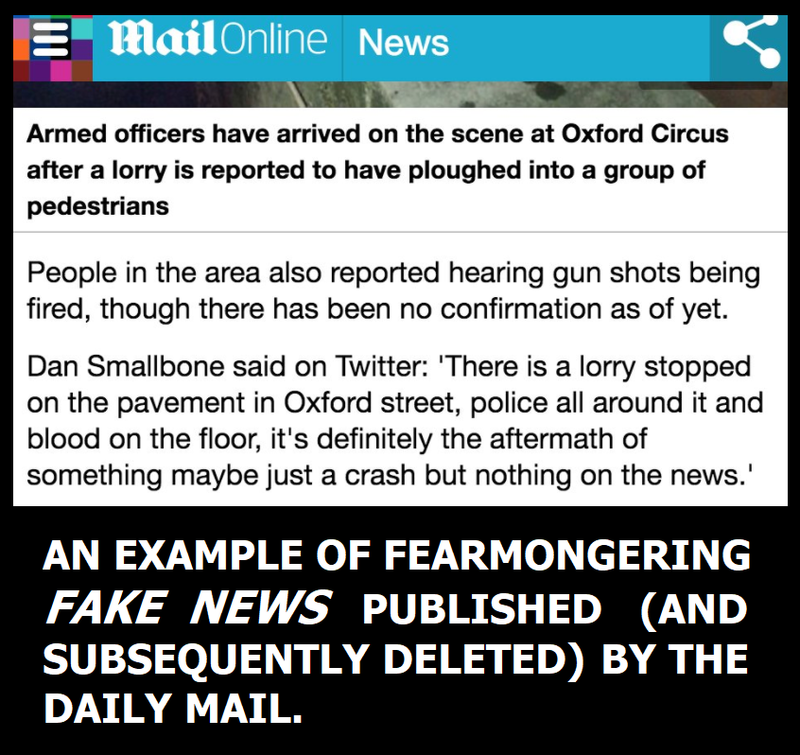 Now consider the absolutely undeniable fake news that the Daily Mail spread about the incident at Oxford Circus on Friday 24 November. 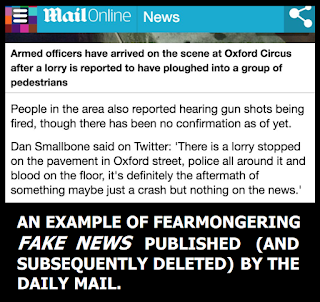 They picked up a Tweet from November 11th and spun it into a headline about a lorry having supposedly ploughed into pedestrians, adding to the fear and panic over the incident. 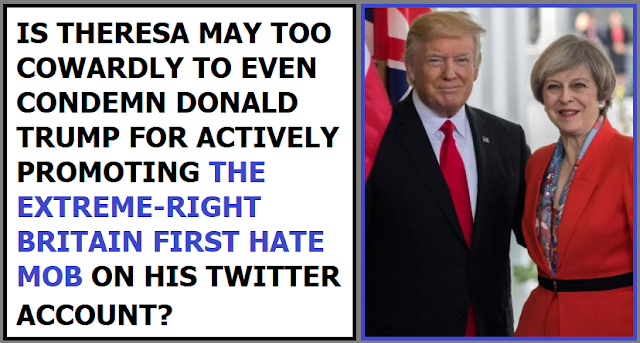 Whether you think the Canary story about Laura Kuenssberg was justifiable or not, there's a vast difference between picking up on publicity listing her as a speaker at a Tory conference event and then working it up into an article about a lack of political neutrality at the BBC, and picking up a weeks old Tweet, combining it with unverified accounts of gunshots and using it to stoke public panic about an ongoing public safety incident. One is an example of stretching something real beyond what it's probably actually worth, and the other is deeply irresponsible fearmongering. Most of the mainstream media let this shockingly inaccurate and deeply irresponsible Daily mail headline pass without comment. The only reasonably big news outlets to run the story were the Huffington Post, RT, IB Times and The Irish Post. Apparently this kind of wildly inaccurate fearmongering by one of the most visited websites in the UK didn't warrant any kind of critical coverage on the BBC! 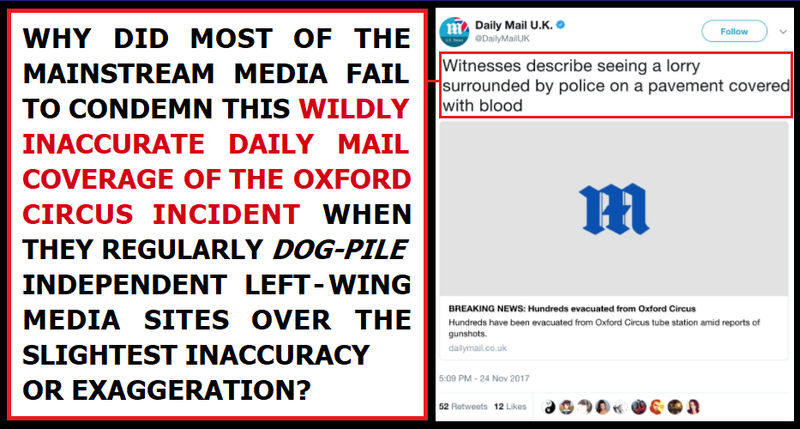 Just imagine how the BBC/Daily Telegraph/Murdoch Press would have dog-piled a site like Evolve Politics or The Skwawkbox had they published a load of pathetically researched, shockingly inaccurate fearmongering fake news about an ongoing public safety incident, then deleted it instead of issuing a proper retraction and clarification? The question here is a simple one: Why is it that independent left-wing media outlets are apparently being held to very much higher standards than the right-wing press? 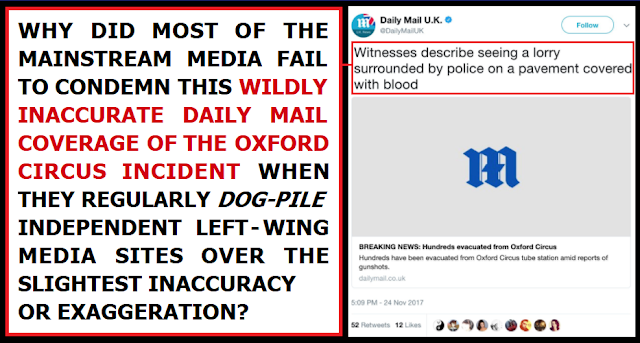 Aside from the Daily Mail fake news about the incident at Oxford Circus, there's also the way that the mainstream media regularly churnalise misleading drivel from the right-wing Guido Fawkes blog into headlines, like the fake news story they broke about Jeremy Corbyn having backtracked on a supposed promise to wipe out pre-existing student debts, when no such promise was ever actually made. There's an ongoing mainstream media tactic of lazily churnalising misleading Guido Fawkes tropes into headlines while the majority of mainstream media coverage of independent left-wing media sites like The Canary, Squawkbox, and Evolve Politics is highly critical on the rare ocasions such sites get coverage at all. 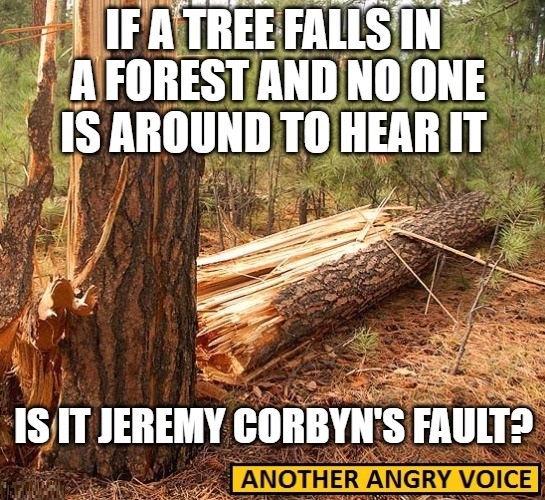 Why do inaccurate and poorly researched Guido Fawkes posts so often frame mainstream media narratives, while a fraction of the inaccuracy or exaggeration from independent left-wing sites would be used to justify the increasingly common mainstream media trope about how such sites are unreliable and inherently untrustworthy? Of course I'm not arguing that independent left-wing media should be afforded the same leeway as muck-raking right-wing trash sites like the Daily Mail and Guido Fawkes. When independent media outlets make mistakes or exaggerated claims it's absolutely right that they issue retractions or clarifications, and everyone in left-wing independent media has a big responsibility to work hard to make sure our assertions are backed up by facts and evidence. The issue here isn't that certain independent left-wing media outlets have occasionally made mistakes or exaggerated claims (of course they have, nobody is perfect), or even that journalists in the mainstream media are seeking to amplify these mistakes or exaggerations in order to discredit independent left-wing media as a whole (self-interested mainstream media hacks attacking a perceived threat to the established order of things is actually pretty understandable). The problems are that the mainstream media fail so badly to dog-pile and eviscerate the Daily Mail and other right-wing media outlets in the same way when they're guilty of publishing very much more irresponsible and inaccurate things, and that they actually churnalise misleading crap from the Guido Fawkes blog into mainstream media headlines without bothering to subject their posts to a fraction of the critical scrutiny they apply to claims from sites like The Canary or Novara Media (on the rare occasions left-wing independent media sites ever actually get a mention in the mainstream media). Why do the BBC rate Michael Gove and the Guido Fawkes blog as more reliable sources than the British Medical Journal? In November 2017 the widely respected British medical Journal published a study suggesting that Tory austerity dogma is linked to 120,000 excess deaths since 2010. The BBC quashed any coverage of this shocking study on the advice of a shadowy advisory group that is part-funded by organisations like the Daily Mail and the UK government themselves. Apparently the British medical Journal and the academics who worked on the study were not reliable enough to warrant any coverage whatever. Fast forward one week and the BBC joined various other outlets in championing an absolute sham of an article from the Guido Fawkes blog accusing other websites of being "downmarket trash clickbait" in an attempt to create a furore over fake news. It is absolutely indisputable that Tory MPs voted to defeat an amendment to the European Union (Withdrawal) Bill designed to ensure that the UK government recognises animal sentience after Brexit. Here's a link to the vote on Hansard. We can all see from the public record that the Tories voted against the amendment to recognise animal sentience, making sure it lost by 313 votes to 295. Tory MPs such as the current Environment Minister Michael Gove (the 3rd Tory Environment Minister in the space of two years!) 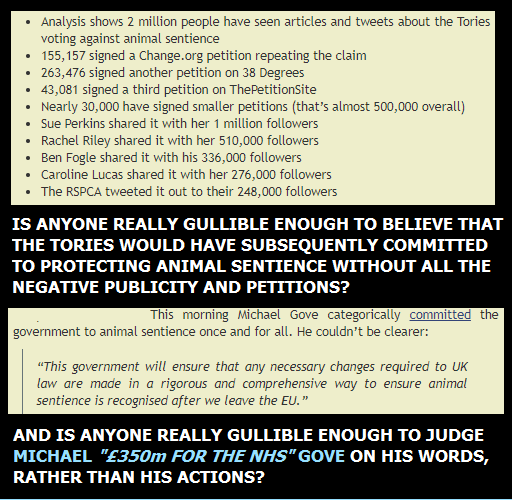 gave assurances that the Tories would one day legislate to recognise animal sentience, but surely such promises from Brexiteers like Michael Gove are only as believable as their outright lies about using Brexit to give £350 million a week to the NHS? Claiming that they have no intention of scrapping the thing whilst simultaneously voting against amendments to prevent them from scrapping the thing is exactly the same Tory trick used to justify voting against amendment 58 to the EU (Withdrawal) Bill which sought to stop them from using Brexit as an excuse to revoke workers' rights, equality legislation, environmental protections, workplace safety rules, and consumer protections. Anyone with a grain of sense should be able to see that any government with an honest commitment to recognising animal sentience, or protecting our EU derived rights could have no real objection to supporting amendments designed to ensure that they can't just scrap these things further down the line. 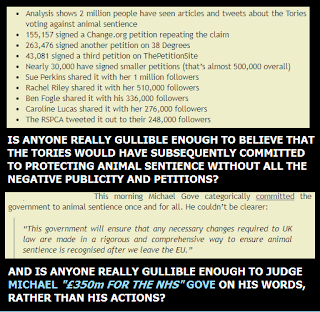 The crux of the Guido Fawkes article was that the horrified public reaction to the Tory scuppering of the animal sentience amendment was "fake news" because we're simply expected to believe Michael Gove's subsequent statement that "this government will ensure that any necessary changes required to UK law are made in a rigorous and comprehensive way to ensure animal sentience is recognised after we leave the EU"
How naive would you have to be to believe that this statement would have been made without all the negative publicity and petitions? And how naive would you have to judge Michael "350 million for the NHS" Gove on his words, whilst completely ignoring his actual actions in colluding with his Tory colleagues to vote down an amendment which would have prevented him (or any future Tory Environment Secretary) from backtracking on that commitment. 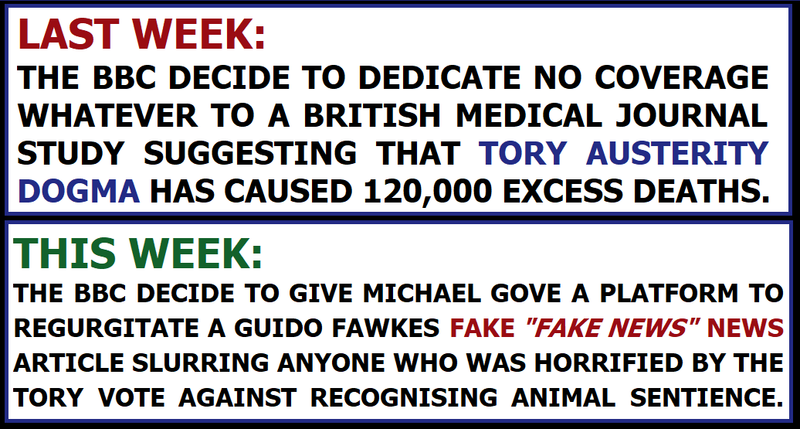 So the Guido Fawkes article is accusing everyone who shared articles and petitions criticising the Tory vote against the animal sentience amendment of spreading "fake news" because ... well ... we're supposed to just believe politicians like Michael Gove are not lying to us! This Guido article clearly uses the term "fake news" in the same way Donald Trump uses it. Not to describe news that is demonstrably fake, but as a pejorative term aimed at discrediting news that they don't like. In a way the Guido Fawkes article is an example of fake "fake news" news. But that didn't stop the BBC from jumping on the bandwagon and promoting the narrative that the uproar about animal sentience is "fake news" because everyone is suddenly supposed to take Michael Gove at his word now, instead of judging him by his actual actions. Incredibly the BBC gave Michael Gove (the man who told us that Britain "has had enough of experts") a platform to whine that "there is an unhappy tendency now for people to believe that the raw and authentic voice of what's shared on social media is more reliable than what is said in Hansard or on the BBC". One minute he wants the public to disregard experts, analysis and evidence when it suits his Brexiteering agenda, then the next he's crying that people don't believe his claims that his words have more weight than his actions! A study conducted by reputable academics from some of Britain's top universities and published in the British Medical Journal was deliberately buried in order to keep it out of the public consciousness as much as possible because it would reflect very badly on the government, and none of the academics involved were invited onto the BBC to discuss the implications of their study. Yet some cobbled-together nonsense labelling all social media criticism of the government as "fake news" because we're all suddenly supposed to take lying Brexiteers like Michael Gove at their word now is deemed worthy of BBC news coverage because it fits with the mainstream media groupthink that independent media and social networks are significant threats to their ability to control public perceptions in the way that they did so brazenly when they decided to not bother reporting on the 120,000 excess deaths scandal. Is it any wonder that more and more people are turning to independent media for their news when the BBC treat the likes of Michael Gove and the Guido Fawkes blog as more reputable sources than the British Medical Journal, the University of Oxford, the University of Cambridge, and University College London? Is Rebecca Pow really so out-of-touch that she thinks people are better off than ever? When the Tory MP Rebecca Pow intervened in John McDonnell's parliamentary speech to make the ridiculous assertion that "people have more money than ever" McDonnell replied in a very polite manner. He calmly pointed out the horrifying fact that there are 4 million kids growing up in poverty in the United Kingdom, and the majority of them actually come from working families. That the working poor make up the majority of people living in poverty in austerity Britain should be common knowledge, but thanks to the complicity of the mainstream media, uncomfortable facts like this are barely mentioned outside of left-wing independent media sites and in the slew of damning reports on the sheer scale of the problem from the likes of the Institute for Fiscal Studies, the Joseph Rowntree Foundation, the Child Poverty Action Group and the Resolution Foundation. It doesn't matter how much we try to raise awareness of child poverty and in-work poverty, there's always some wealthy insulated Tory around to pretend that things are fantastic, and that we've actually "never had it so good". The problem for Rebecca Pow is that the Tory budget is full of explicit admissions that Tory austerity dogma is failing Britain, and failing British workers. 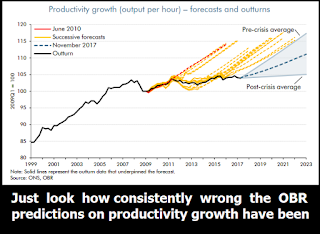 Aside from the downgrades in the UK economic growth forecasts, deficit reduction, and productivity, there's also a damning admission that the (already record-breaking) squeeze on UK workers' wages is set to continue into the next decade. This means that the real value of workers' wages is not going to return to 2007 levels until early 2025. That's an astounding 17 year period of zero real terms wage growth. That's a generation of workers who have had their earning potential cruelly and deliberately blighted for the most productive years of their careers as a result of ruinous Tory austerity dogma. Instead of progressing up the pay scale like previous generations did, millions have been trapped in low-pay insecure work without a decent pay rise in years, meaning they're actually worse off now in real terms than they were a decade ago. 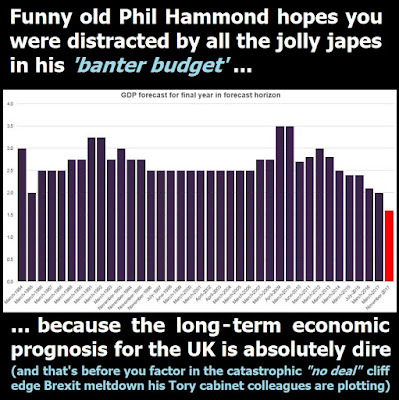 It doesn't matter how many jokes and jolly japes the Tory Chancellor Philip Hammond padded out his "banter budget" with, the economic prognosis for the UK is absolutely dire, especially for ordinary working people. 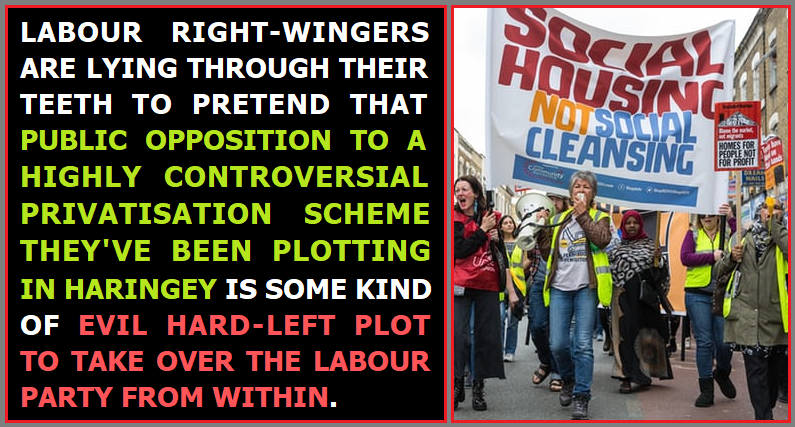 The really sad thing is that millions of working people are so immune to reality that they'll actually believe the likes of Rebecca Pow and the right-wing propaganda merchants when they tell them that the Tories are doing a fantastic job and that they've never had it so good. They'll forget all about the fact they haven't had a real pay rise in years; their nephew being exploited in the fake self-employment gig economy while their boss hides all the profits in tax havens; their niece on a dead end zero hours contract bringing her daughter up in grinding poverty; their mother being denied the social care she paid for with a whole lifetime of National Insurance contributions; the ever-worsening chaos in their local hospital; their neighbour forced to go through humiliation after humiliation to obtain the disability benefits they deserve ... because they keep on reading what a spiffing job the Tories are doing of running the economy in the pages of the S*n/Daily Mail/Express/Telegraph. 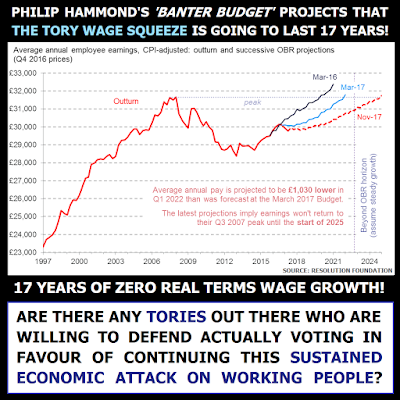 People like this will never read about how Philip Hammond's "banter budget" extends the Tory wage squeeze to 17 years, the dire state of the UK productivity crisis, or the soaring rates of child poverty and in-work poverty, because the Tory party rely on the ignorance of the masses to get away with what they do, and the right-wing press dutifully foster ignorance by not giving these vitally important issues anything like the coverage they deserve. Until ordinary working people stop reading the right-wing propaganda rags, and stop uncritically believing Tory politicians when they defy reality by claiming that people have more money than ever, it's difficult to see how things can actually get better. 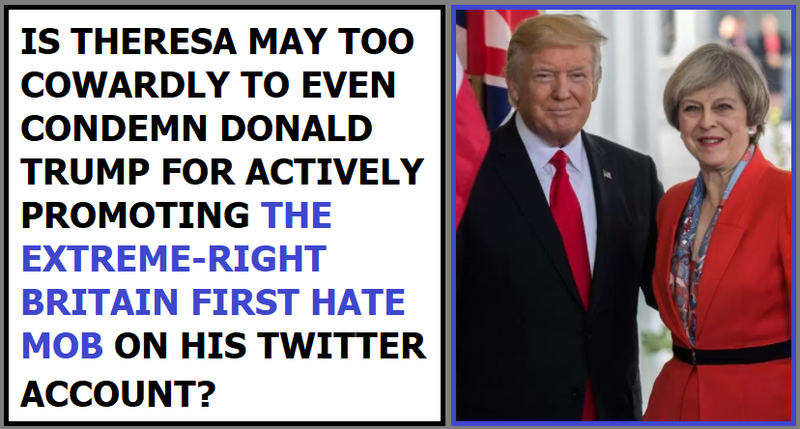 The Conservatives absolutely love to use the impressive-sounding big number technique to bamboozle the gullible into believing that they're doing a great job. 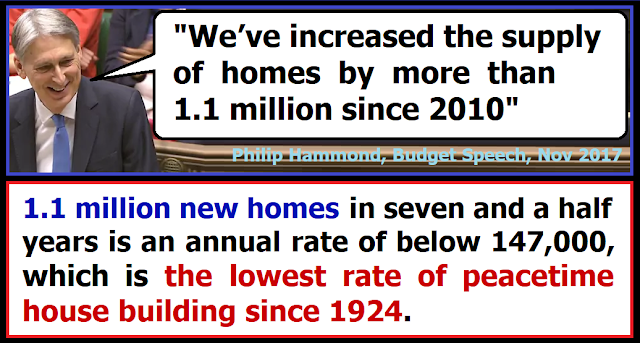 On the face of it Philip Hammond's budget announcement that 1.1 million new houses have been built since they came to power in 2010 sounds good, but only if you completely ignore all context. In reality, far from being something to boast about, this level of house building is actually the lowest since 1924. What's even worse is that the Tories have delivered this piteously low level of house building at a time of extremely high housing demand. Despite their ludicrous pledge to reduce net immigration to below 100,000 the Tories actually oversaw the biggest inwards surge of migration ever, peaking at 336,000 in 2015. 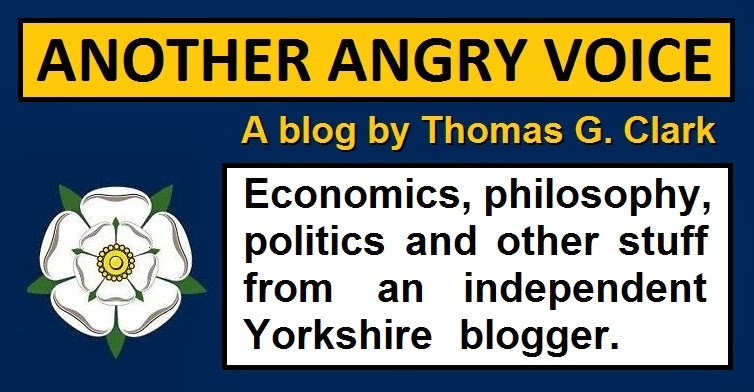 Immigration in itself is not harmful, but if the government of the day does not account for it by increasing housing stock appropriately and by improving and expanding local services in areas that experience high population growth, then it obviously creates problems. Not only did the Tories fail to deliver the level of required house building to cope with their immigration surge, they also set about gutting funding for local infrastructure and services out of ideological adherence to ruinous austerity dogma. Then there are other factors to consider too. Demographic changes and lifestyle changes mean that home occupancy rates have been declining for decades, with more people choosing to live alone, and fewer large (and extended) families occupying a single home. This means we need more houses per head of population these days. The result of the Tories' woeful mismanagement of the housing sector means that house prices have risen to their most unaffordable levels ever, and soared miles out of the reach of millions of ordinary working people. In the context of such a severe housing crisis the presentation of out-of-context figures as some kind of great achievement is a massive slap in the face for the millions of ordinary working people who have been locked out of the housing market and been left to the mercy of the virtually unregulated profiteers in the private rental sector. What's even worse is that when the Tories had the chance to help people stuck in the private rental sector out a bit, they callously voted against measures to ensure that all rented properties are "fit for human habitation". In the end it's all just Tory smoke and mirrors. 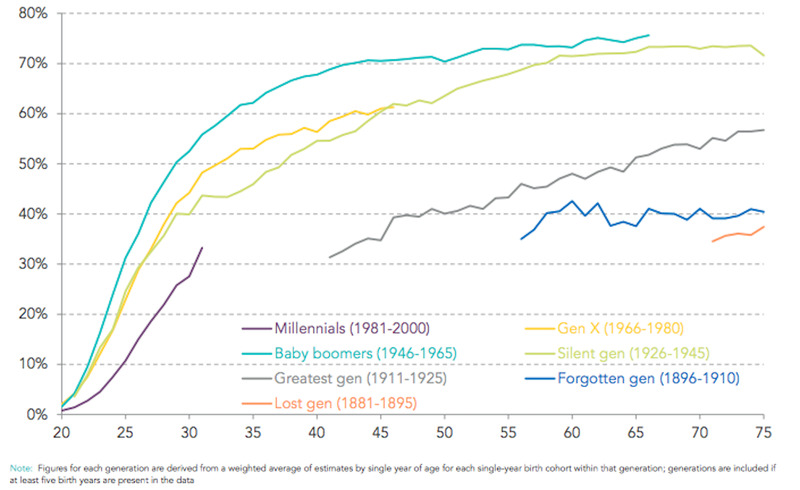 They don't really give a crap that home ownership rates have absolutely collapsed for the under-40s. They're much more interested in stoking house price inflation in order to benefit the older generations of home owners, and protecting the value of the buy-to-let property portfolios built up by the idle rentier class. So just imagine the contempt Philip Hammond and his scrip-writers must have for the younger generations who have been priced out of home ownership that they imagine they can be duped into supporting the Tory party with such an absurd display of wilfully out-of-context bragging. Who is actually laughing at funny ol' Phil's "Banter Budget" japes? Oh how the Tory front bench laughed at all the jolly japes in funny ol' Phil's "banter budget". Jeremy Clarkson jokes, digs at Labour and the trade unions, "I'm a Celebrity" references, and Theresa May wielding cough sweets as if her cough was the only lame thing about her dire conference speech in October. If you ever needed evidence that the Tories are a bunch of massively over-privileged toffs who treat the job of running our economy like some kind of private school lark, then this budget speech was it. One of the big figures not many people have picked up on is the revised £25.8 billion increase in the projected borrowing figures because the OBR are finally beginning to accept that their hyper-optimistic productivity projections of the last seven years are nowhere near the austerity era trend. 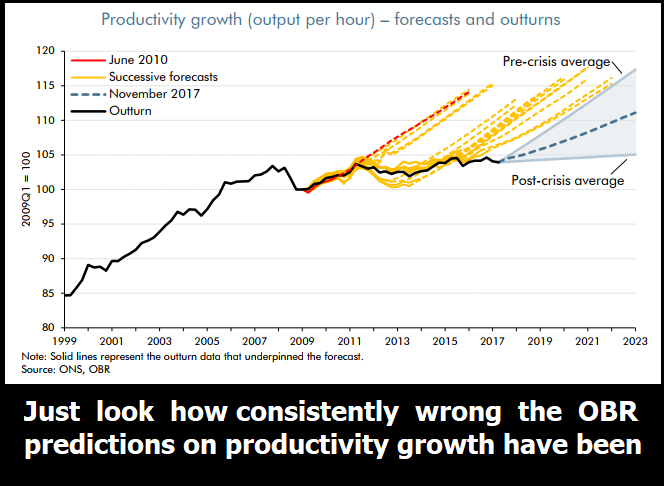 As you can see from the chart above it's the first time they've not assumed that productivity is due to return to the pre-crisis trend, but they've still only halved their unrealistic expectations, rather than matching them to the dreadful almost zero improvement trend during the whole Tory austerity era. 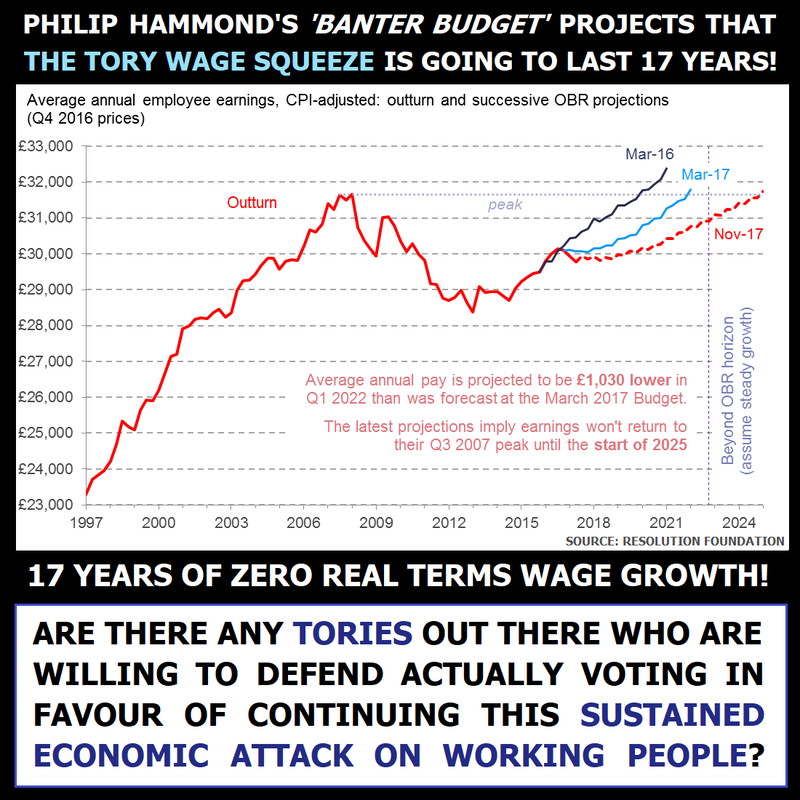 There's always the fake good news to look out for in a government budget, and this time around it was Hammond's claim that debt as a percentage of GDP has already peaked in 2016-17 instead of continuing to rise until the end of this financial year, which has apparently only been managed by sneakily hiding £60 billion worth of social housing debt off the public balance sheet. Not only was the budget another admission of the failure of Tory austerity dogma, their unwillingness to properly fund our vital public services, and the economic folly of Brexit, but there was very little in it to sweeten the bitter pill for people who are really struggling. Hammond's "millenial railcard" is an absolute scam of a bribe given that it won't apply during commuter hours, and isn't available to the over-30s who have endured a 27% hike in rip-off rail fares since 2010 (double the rate of wage increases) and are now facing the biggest rail fare hike in five years in January. In fact I'm fairly sure that for every gullible under-30 who is duped into voting Tory with this scam of a railcard, there will be half a dozen over-30s who realise that a railcard they're not even entitled to claim is insufficient compensation for having had the most productive work years of their lives blighted by the effects of Tory austerity dogma. On the housing crisis Hammond gushed about the Tory policy of stoking house price inflation by pumping £billions into their Help to Buy scam, and reiterated the same old Tory gubbins about how they aspire to increase house building rates, with no acknowledgement whatever that between 2010 and 2017 they oversaw the lowest level of new house building since the early 1920s. 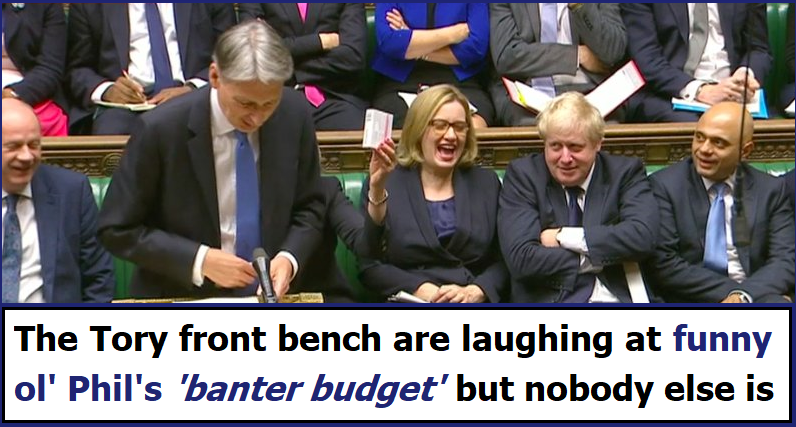 Then there was the announcement that the Tory benches really cheered. Abolition of Stamp Duty for first time buyers of properties worth up to £300,000, which will cheer younger people with enough cash to actually buy a house, but mean nothing to the millions who have been priced way out of the market. To them it's obviously just another Tory giveaway to the already quite well-to-do. It's also worth noting that the Stamp Duty cut for first time buyers is projected to increase house prices, pushing them even further out of reach of those who are priced out of the property market. On homelessness Hammond pledged to eliminate rough sleeping by 2027 without even a hint of an admission that rough sleeping rates have doubled on the Tory watch since 2010. Even when it came to the NHS, Hammond fell short of providing the £4 billion emergency funding that the health service chief Simon Stevens had called for. 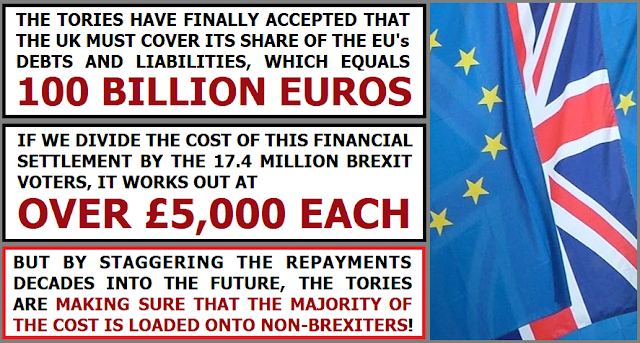 It's difficult not to see the headline pledge of £350 extra for the NHS for the entire 2017-18 winter period as a deliberate insult, given that several of his front bench colleagues promised that exact figure of £350 million for the NHS per week, not per winter. George Osborne's approach to budget day used to be that it was better to distract the plebs with trivia like a penny off the price of beer or a ludicrous tax on pasties (that he could row back on later in the week) than to have them thinking too much about the dire state of the economy, or the way he was continually missing all of his economic predictions. Hammond's approach is different. 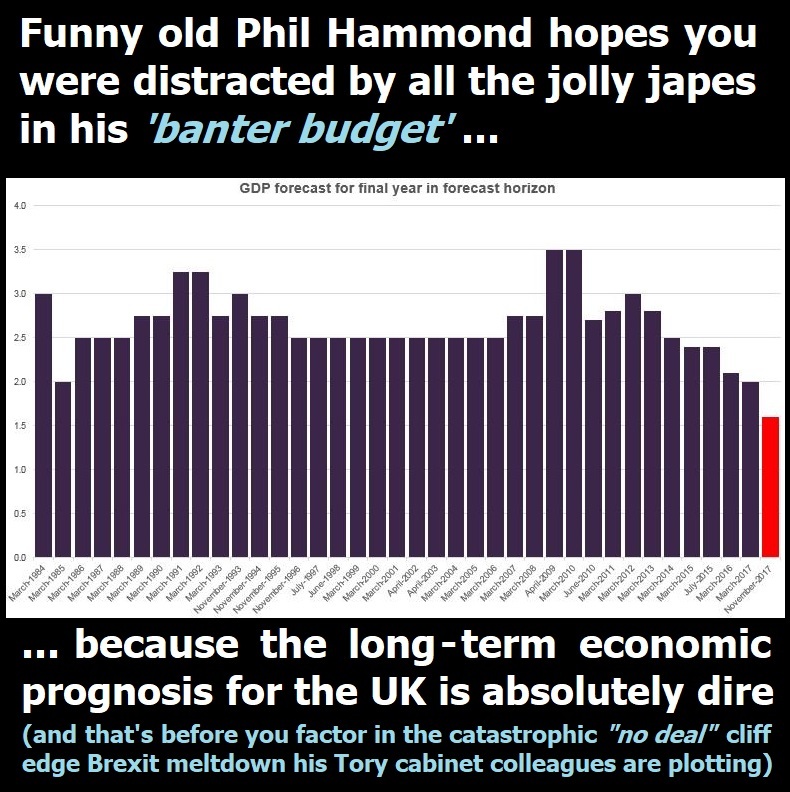 He thinks the proles can be distracted by Jeremy Clarkson puns and oh so witty "I'm a Celebrity" references, but given the absolute state of the UK economy these days, most people will conclude that funny ol' Phil has badly misjudged the mood of the nation with his 'banter budget' full of jolly jokes and japes.